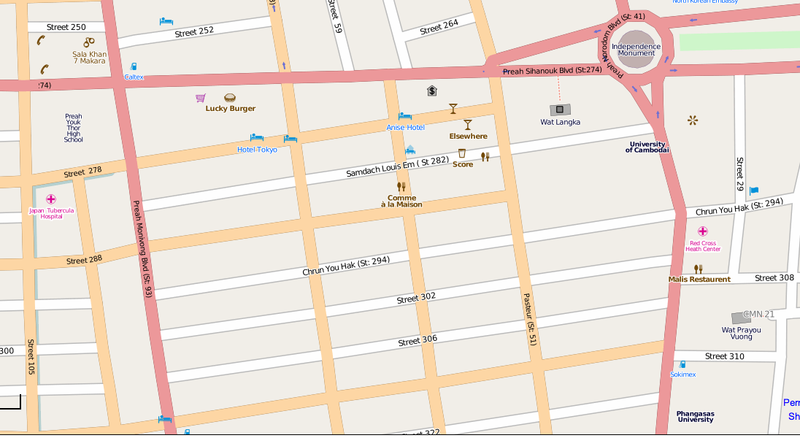 In October 2011 Google Maps removed the numbers from the Phnom Penh map – making it nearly impossible to use Google to navigate the city – unclear why they did this. Below a recent news story about how the streets are numbered – although this still doesn’t answer who numbered them and why. Or why the streets are numbered in irregular intervals along a regular grid? Screenshot. Google Maps. December 13, 2011. Screenshot. Open Street Map. December 13, 2011. A cyclo driver looks perturbed as he navigates his way down Sothearos boulevard. It would make a good question in any pub quiz night: which capital city has streets named after Charles de Gaulle, Mao Tse Toung, Josep Brotz Tito, Pasteur, Czechoslovakia, France, Yugoslavia and the Polish Republic? Any long-term Phnom Penh resident would know, but strangers to the city would be nonplussed. However, that is not to say we couldn’t play an enjoyable variant in Phnom Penh of “what were they called before” or “how far apart”: excellent indoor games for those rainy season evenings. The first is not too hard. The Russian Boulevard, or more correctly Confederation de la Russie, was of course called USSR but the Quais Verneville and Piquet have over the years become the prosaic St 106 and St 108 respectively and nobody knows them as Treiyani and Oknha Plong anymore. Some are aware that Sothearos was Lenin, so to speak, and Norodom spent some time being Tou Samouth after the original name of Boulevard Doudart de Lagrée was overturned along with all the other luminaries of the French Protectorate. The one exception is Pasteur, which has the distinction of being the only survivor and is still used by Phnompenhoises. The thing about Phnom Penh street names is that they are fun for every purpose except the obvious – identifying where you are or where you are going. The names, however, are as nothing to the problems of street numbers. Here the rule is that, in the main, odd numbers run north south (with the street numbers increasing as you head west) and evens east west (increasing as you head south). With the exception of the stretch of Mao Tse Toung  to the west of its junction with Norodom, this tenet applies reasonably well to most of central Phnom Penh, aside from the diagonal streets to the southwest of Olympic Stadium. Could a street name or number cause a diplomatic incident? Well, our old friend St 128 nearly has. Known now as Kampuchea Krom, it was called Cambodia-Vietnam Friendship St when the Vietnamese were in charge and in the days of the French it was simply the Road to the Annamite (Vietnamese) cemetery. One commendable change is that St 96 has been named Christopher Howes after the gallant English de-miner who was abducted with Houn Hourth, his interpreter, and murdered by the Khmer Rouge in 1996. One assumes there was a theory behind the naming of streets and one can sympathise with a desire for reclassification when the French stopped “protecting” Cambodia in 1953 and left behind Field Marshal Petain [St 86]. Again one can understand how everything had to be new under Sihanouk in the 1960s, but what was going on in whose mind when the numbers were given out? It’s almost as if the person behind the conundrum was given a mixed bag of numbers akin to lottery tablets and then asked to throw them on a map of the city. Where they landed was the number of the street, irrespective of its neighbourhood’s location. I jest, but sometimes you get the feeling that there’s some evil genius behind the numerology of the street system that constantly conspires to make you late for every appointment. It is not as if street numbers are the only problem in finding your way around. Try the house numbers. Many single dwellings have two numbers and many multiple dwellings have one, but never make the mistake of thinking any street has any house number that is exclusive to one location. Take St 310 for example, which has at least two house number 39s. Or St 178 where the house numbers increase as you head west from the river, then mysteriously begin at number one again as you cross Norodom Bvd. The other parlour game one can enjoy playing is “how far apart?” It relies on the common mistake of thinking that street numbers are adjacent to one another because they are numerologically close. Take St 516 and St 514 which, being even numbers, you might assume were close to one another. According to GPS, however, they are 5.4km apart by road, which is a long ride in a tuk-tuk if you are leaving one location and looking for a restaurant in the other. Perhaps the whole matter is best summed up by a walk along the riverfront. Sisowath Quay – named after the king who reigned from 1904-27 – was, until the 1970s, a strip of three- and four-storey shophouses linked to the capital’s vital role as a thriving port capable of accommodating vessels of 6,000 tons. The pavements were a bustle of ship’s chandlers selling their wares and coils of tarred rope, provisions stores and shipping agents’ offices supplying ship’s bosuns and galleys. There was also a scattering of cheap diners and several coffin makers, two of which survive to this day. Those rough and ready days, described by Henri Mouhout, the French explorer who rediscovered Angkor, as a long and dirty floating town, gave it the unruly and slightly shady look of a bazaar. The years have been good to the quay. Today it is a chi-chi and mostly fashionable line of modern glass and steel restaurants and bars. As is the case of so many ribbon developments in cities around the first and third world, the street where they trade and live has had the habit of changing its name according to political whim, fashion and national pride. So over the years the quay has been Karl Marx, then the Grand Rue before it was christened with the royal hand-me-down name. 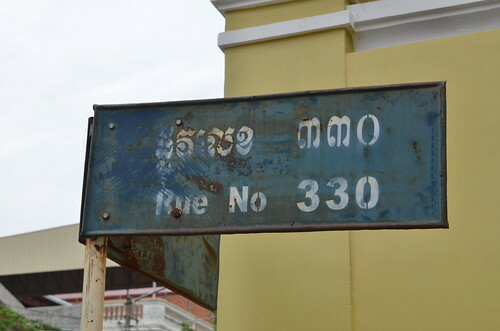 Not that the name changes mean a great deal to the city’s motodops and tuk-tuk drivers, who wisely follow the code of street numbers rather than names that seem to change with the weather, or rely on local landmarks to find their way around. Few people, even those who have lived here a long time, know the actual designation of this most important thoroughfare in Phnom Penh. But yes, logic at last. You have probably guessed it . . . it is St No 1. 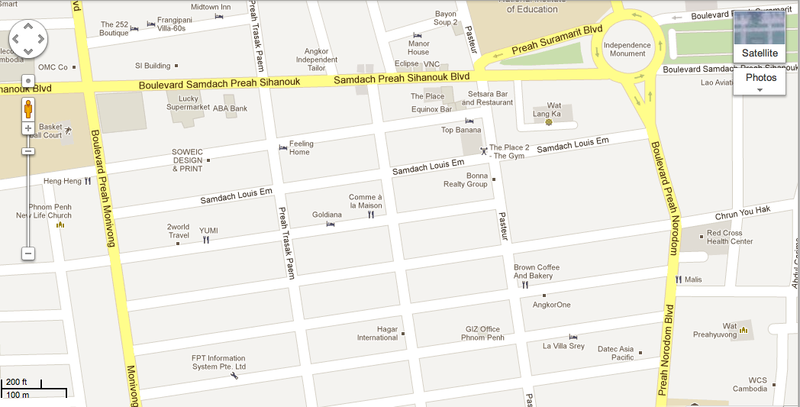 And finally, after 26 years in power Samdech Akka Moha Sena Padie Techo Hun Sen is to have a new road named after him. One of the biggest infrastructure developments of recent years, the 60 metre wide, 9km road will link St 271 to National Road 2 at Ta Khmao.